State Senator Jean Orie is under investigation by a grand jury for activities of a criminal nature, mainly using her Senate office for fundraising purposes regarding her sister Judge Joan Orie Melvin’s election to office. I would go into more detail, but I managed to pry my eyes off of the kitten that died on her head, but only long enough to fixate on her thumb nail. And that’s where I’m at right now. Just staring at that thumb nail. How can you see her thumbnail? All I see is pink, and I’m colorblind. And don’t forget her staffer who got arrested this past summer. Gross! Otherwise, put her in a pair of black tights and she could star as Rizzo in the CLO’s production of Grease this year. thanks for reminding me — I have to get to the store to get some more pepto bismol. I just know that the Christmas food is gonna get me again this year…. She needs nails that long, just to scratch her head. Maybe she’s really the stunt double in Blonde Ambition. Pinto Alegre — Ewww! that should be in the Nasty Burgher category. If Reese Witherspoon ever sees this picture, any hope the studio has of another “Legally Blonde” sequel will go right out the window. And we have the gall to criticize how Benny looks! At least he produces (big comeback on Sunday plus two Super Bowls at last count). What, except for a Supreme Court election, has she produced? Except, you know, the look. Oh…are there any questions why Harrisburg doesn’t get more done after looking at this? Nah…me neither. i’d like to know who does her hair and then let’s her go out looking like that…..
Let me at her with a nail file. Goog gracious, where is she going for her beauty services? Of course, looking at the big picture, I’m convinced after the last year of scandals, indictments and trials involving our state politicians, that you’d be hard pressed to find any of them that aren’t ‘ethically challenged’ when it comes to following any sort of law, whether it be administrative or criminal. Wide nervous eyes, crazy hair and loooong nails. Um, I’m pretty sure that is the look of a coke head. Whoa! Send her down here to FLA. We have a long line of crazy women who think and dress like they are 15-year old prosti-‘tots’ and get really miffed when no one takes them seriously, ie, Katherine “Hanging Chad” Harris and State Sen. Ronda Storms (not her stripper name, her real name) who has toned down her excessive display of cleavage, but not her anti-black, anti-gay, anti-Planned Parenthood, Southern Baptist “I am a Republican, hence I stand with God” rhetoric. She needs some Kitten Mittons! 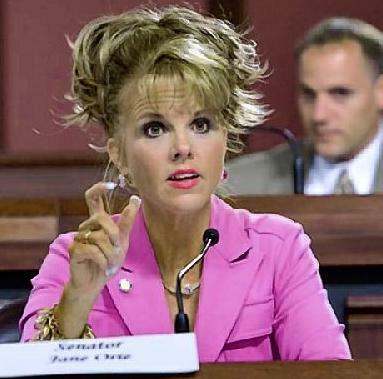 So, serving in our state “government” is where Vegas showgirls go for retirement? I always thought she looked like a yorkie. Skippy would hit that. Or maybe already has. Right on….I thought the same thing when I saw this on the PG. Everyone thinks his/her state politicians are the most corrupt in the nation, but I gotta hand it to Pennsylvania (and Illinois): West Virginia got NOTHIN’ on y’all. NOTHIN’. Dat beyatch would not be makin’ my Pittsburgh Girlz Gone Wild video.